On July 31, 2015, I got on a plane and started my journey towards my destination – in the rain forest/beach at the Goddess Garden in Costa Rica. 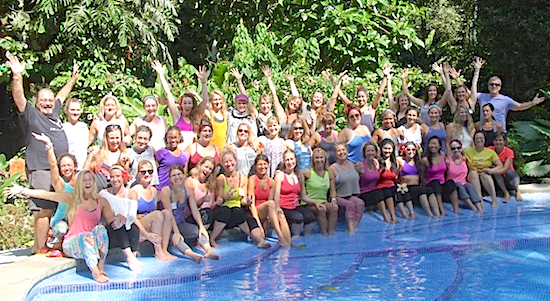 I went to spend 2 weeks training to be a teacher in Hatha yoga with Marianne Wells Yoga School. 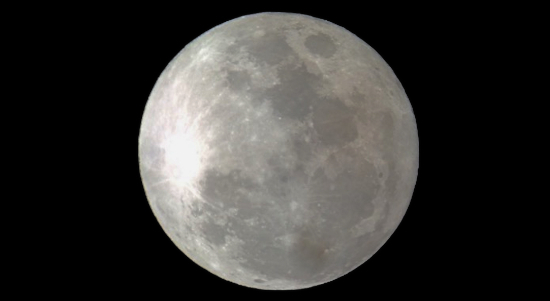 This day stood out in my mind – for it was the second full moon in July, otherwise known as the Blue Moon. The reason we say ‘once in a blue moon’ is because it doesn’t happen very often. I was embarking on an adventure like none other I had experienced. I didn’t choose to go to 200 hour yoga teacher training because I’ve always wanted to be a yoga teacher. I was looking for something else at the time – but couldn’t articulate it. I was drawn to Costa Rica. Always being the type to follow my gut, I found Marianne Wells Yoga School pretty quickly. I signed up for the best impulse decision I have ever made in my life. What I didn’t know at the time is that I was looking for mySELF. I had lost her somewhere in the male dominated corporate world in which I live. Looking for the girl underneath the fitted blouse and blazer. The girl with tattoos that told a story and stars in her eyes. She needed so badly to be nurtured. Somehow Marianne Wells and her team helped me figure out what I needed to re-connect with my SELF. I am so grateful. Each night at the training, as I walked back to my room, I could hear the nighttime sounds of the rain forest. Deep in the darkness there were howler monkeys, birds, frogs, and countless different kinds of bugs and crickets. The crickets at night sounded like bells ringing in the forest. I was not surprised to learn in my chakra studies that the sound that resonates with the heart chakra is the tone of reverberating bells. We went to bed each night tired, with our hearts open and happy. Astrologers will tell you that the full moon is a great time to meditate on things in your life that you are ready to release. That is exactly what happened while the moon waned from full during our time together. We let go. We let go of expectations and surrendered to the program. We let go of our daily routines and learned how to live together where the rain forest meets the Caribbean Sea. We broke down walls we didn’t even know we had. We shared and healed within our yoga family. We held each other up, and laid a solid foundation for lifelong friendships. We learned much about yoga. We learned about our Selves, and how yoga helps maintain and regain our center and balance. We didn’t just learn how to teach a dynamic flow. We learned how to take our daily practice off the mat and live the yoga lifestyle. Two weeks of rising early for our 6am practice, anatomy lectures, asana workshops, sutra philosophy discussions at poolside, chakra studies, Ayurveda homework, practice teaching – all during long, interesting days. On the night of August 14 – while in my room preparing for graduation dinner with my roommates – browsing my social media feed – I realized it was the night of the new moon. After two weeks of letting go, all the learning, all that studying, it was time to enter a new phase. It was a new moon! A new moon for a new start. A new moon for a new yoga teacher. Such universal alignment with the moon watching over me and my new yoga family on this journey. It makes so much sense you see. Ayurveda teaches us that the moon belongs to the goddess, the divine feminine. It was no coincidence we all joined together – under the blue moon. I found what I was looking for, though when I set out on my personal journey I wasn’t even sure what it was. I followed my gut all the way to Marianne Wells Yoga School and found my SELF. She was always there inside me. She needed some major nurturing and guidance to find it. It’s been two moon cycles since that night. From one new moon to the next, I have not stopped nurturing that lost girl. She’s not so lost anymore. I am more aware of myself and who I am than I have been in a long time. I am practicing yoga both on and off the mat. I am conscious and aware. 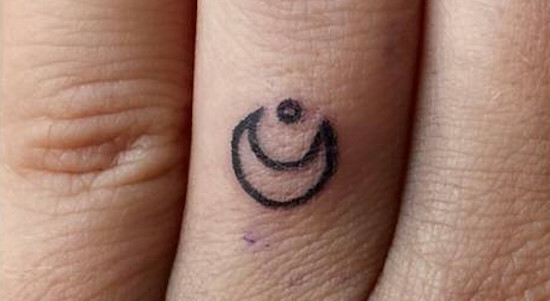 The day I returned home, I got a waxing moon tattoo on my left hand ring finger – the ayurvedic moon finger – to remind me there is always a divine goddess inside me. She is simultaneously wild and peaceful. I’m back in the hustle and bustle of my busy city life now. There is a calmness, a voice in my head that reminds me to breathe. Breathe deep down into my toes, into my soul, and exhale everything…. Just let it go. Kellie, I’m so grateful to have met you dear friend! You are beautiful inside and out! I I agree, it was no coincidence that we were all there at that specific time and place together! It was meant to be and I’m grateful to have been on the journey with you!!!! Love you friend and I wish you all the best !!!!!!❤️?? We all came to this place at this time for different reasons. We spent time asking each other why we came, what drew us here, what we sought. We all gave each other answers. And somehow, I think each of us knew that while the person giving answers was being sincere, she was discovering every day that, to quote Alison Crouse, “all those answers that I started with turned out questions in the end” . But what a joyful journey to travel with other wanderers, coming from vastly different starting points, and even heading in many different directions, but going TOGETHER! Some of us knew EXACTLY what we were coming for (so we thought! ), and some of those expectations were met, but interestingly, these things often became the least important part of the experience. Many of us were opened up in ways that we didn’t even know were within us. This was at times painful, many times cathartic, ALWAYS interesting. As Kellie has so beautifully said, our essence of Self was explored in such ways that none of us imagined would happen, and I would boldly say that each of us is better for it. Being further on my own journey than many (just because of my age), while I thoroughly enjoyed my own discoveries of Self, it was particularly rewarding to watch younger versions of myself grow so much in such a short time. I can see for Marianne and Ron how this is a truly rewarding process to lead–as many times as they go through this with any group, and exhausting and repetitive as that may become at times, there is always a blessing and reward in watching these students on this journey that is SO much more than yoga/yoga teaching. I am hopeful for continued growth through the continuing journey for each student with whom I was fortunate to share the Goddess Garden for this very special, unforgettable time. Thank you, Kellie, for expressing this so beautifully, and thank you Marianne for sharing it! Namaste AND Pura Vida!!! Thank you for your comment Sarah. We are tremendously blessed and grateful to all who enter our lives. This is never repetitive to us, as we continue to learn important lessons from every individual to help us on our personal journey. When one is fulfilled on a spiritual level, it carries you through any dips in physical energy levels. Shanti Prem. Kelly, this is seriously so cool. You’re a beautiful writer and a pretty rockin chick. This is really inspiring and awesome. I love learning about the moon and how it connects to our lives. Glad you realized this connection and got to explore yourself. Costa Rica was definitely much more than a teacher training, and was more of an experimental self-learning trip. We’re so lucky that we were guided through a self awakening journey. Hope you’re killin it in Canada, miss you! Thank you for sharing your story so eloquently. I too am consumed by a busy corporate life while I look for mySELF. In one month I will be traveling to Costa Rica to experience Marianne Wells Yoga School and I look forward to my personal experience. Best of luck in all you do!